Egyptian authorities are preparing a roadmap to push forward stalled internal Palestinian reconciliation, sources told Al-Quds Al-Arabi on Friday. According to Al-Quds Al-Arabi, the plan hopes to bring rival Palestinian factions Hamas and Fatah together, leaving the current government led by Rami Hamdallah in office and enabling it to run the Gaza Strip. In addition, Hamas, Fatah, and the other Palestinian factions will begin by discussing the formation of a national unity government within three months. Informed sources told Al-Quds Al-Arabi that Egypt had informed Fatah of this intention. Fatah says that it would accept this roadmap if it was officially signed and carried out under direct Egyptian supervision, Al-Quds Al-Arabi reported. 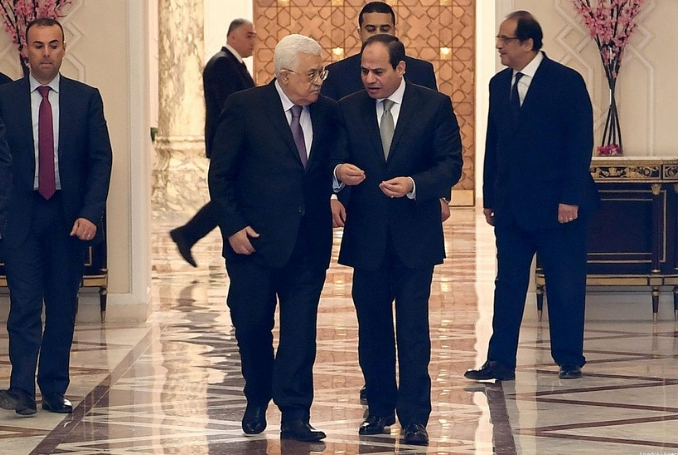 The newspaper also said that Egypt is preparing to hold an expanded meeting for all Palestinian factions to announce the new roadmap, the terms of which have so far been kept secret. It is likely that an Egyptian delegation will remain in Gaza to ensure the implementation of the roadmaps’ terms. Be the first to comment on "Egypt Prepares Roadmap for Reconciliation of Palestine Factions #Palestine #GroupPalestine #israelTerrorists #boycottIsrael"